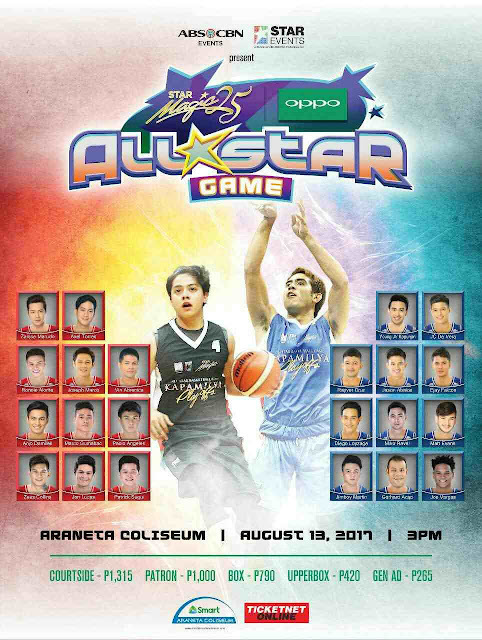 "OPPO's partnership with Star Magic All-Star is OPPO's way of giving back to its loyal fans through an exciting star-studded basketball game. OPPO is all about capturing the best moments in life with just one click and the Star Magic OPPO All-Star Game is the perfect avenue for fans to use their OPPO smartphones in capturing the best moments on and off court," said Stephen Cheng, OPPO Philippines Brand Marketing Manager. The battling teams are Team Daniel and Team Gerald. Team Daniel include Zanjoe Marudo, Joseph Marco, Vin Abrenica, Zeus Collins, Anjo Damiles, Marco Gumabao, Patrick Sugui, Jon Lucas, Paolo Angeles, Axel Torres, and OPPO ambassador Ronnie Alonte. Meanwhile, Team Gerald are Rayver Cruz, JC De Vera, Ejay Falcon, Jason Abalos, Matt Evans, Diego Loyzaga, Miko Raval, Young JV Kapunan, Jimboy Martin, Gerhard Acao, and Joe Vargas. Expect an energetic match between the two Kapamilya teams and all these can be captured using OPPO F3, the selfie expert smartphone, It has a dual selfie camera to capture wide angle selfies, a fast 13MP rear camera, 4GB RAM and 64GB storage to capture tons of photos and videos. Treats are also in store for fans as there will be performances and guest appearances from Star Magic and Star Music artists during the event. Fans can also win tickets to the event by joining the exclusive OPPO FB fan page giveaways. At stake are tickets for Upper Box or Patron seats. Fans can simply visit OPPO Philippines FB Page and follow the posted mechanics. The contest will run from July 28 to August 9, 2017. Announcement of winners is on August 10, 2017 via OPPO Philippines FB Page.